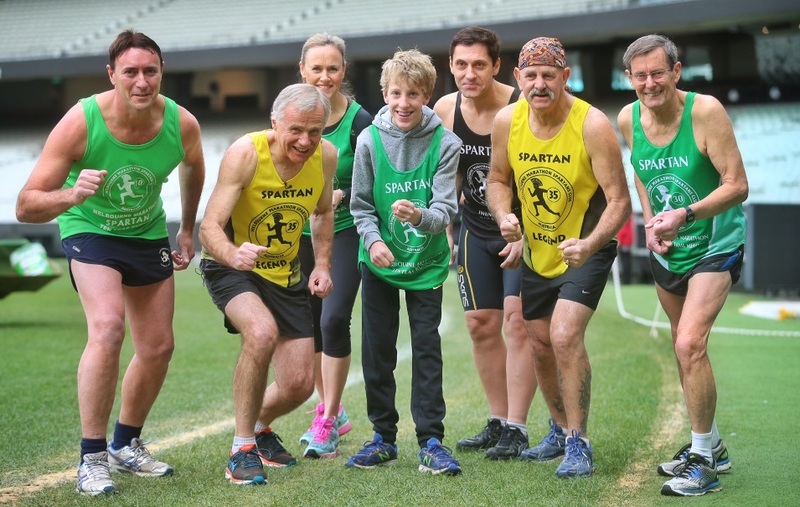 When the Melbourne Marathon Spartans committee first heard that Tate Kemp was about to complete his tenth run and that he would like to be a Spartan we quickly decided that we needed a new category of member. 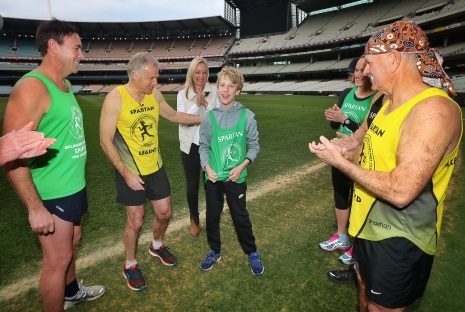 Thus, Tate will be an honorary Spartan, and members of the committee were on hand at the MCG to present him with his singlet in front of the Channel 9 and Herald-Sun cameras. Click here for a high quality video of the excellent Channel 9 News feature. See this page for some photos of Tate after the official presentation at the 2016 Annual General Meeting of the club. For a number of years now, South Melbourne Athletic Club have been operating the drink stations in the Beaumaris area and we had become quite adept at setting up, serving the runners, then packing up and heading off home by 11am. I’m oblivious to who it was, but in a moment of insanity, someone made the telling decision to anoint me the “sector leader” of the 5.5km event. This role involved attending a meeting two weeks prior, attending again on the Saturday to pick up equipment, get driven around the course and recheck all those little details that needed reconfirming. I guess the fact that I drive a ute had something to do with getting roped into the job!! I was a smidgeon disappointed that I wasn’t going to get to see the majority of the marathon but as the 5.5km event got underway, I soon got to experience something that will always sit with me. Waiting at the 1km mark and ready to take up my duty of following the rear of the field, I chatted with a course marshal until what I assumed was the final runner came through. Preparing to re mount my bike, I caught sight of what I thought was a pink race number still some distance away. With 40 minutes on the clock a blond haired youngster no older than five approached via his walking frame and with the helping hand of his father and a couple of family members. 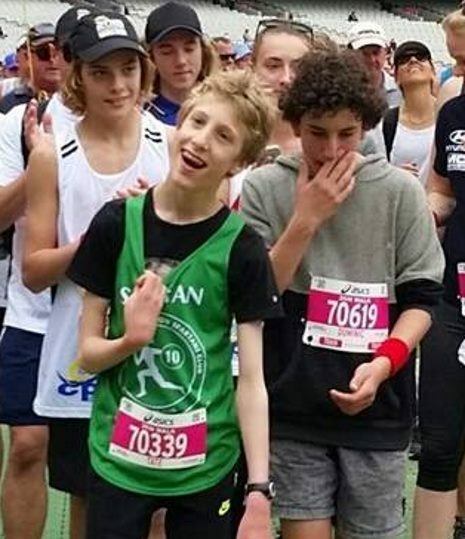 Not allowing Cerebral Palsy to hinder his determination, the young lad had his number pinned proudly on his chest and was full of enthusiasm as he made his way along the course. I assured the entourage that I would stay close by and that they had all the time they wanted to finish. As he made his way beyond 3km, all my marshals had packed up and gone, thinking that no one was still on the course. 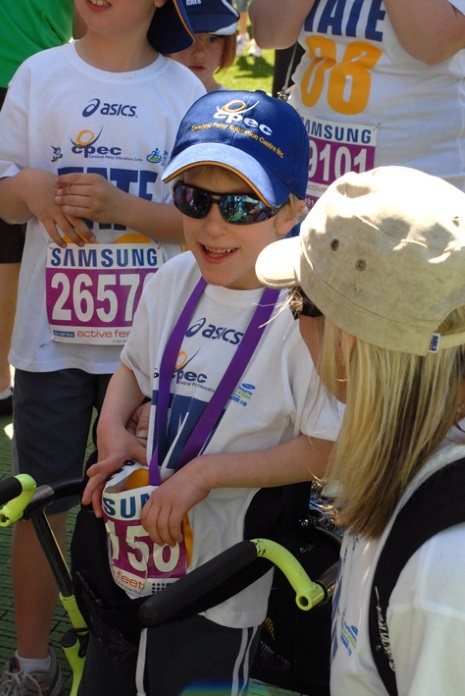 It was a privilege to guide this incredible youngster and his family to the finish. This wasn’t a case of parental pushing at all. This young fellow wanted to do the race himself and he remained positive and determined throughout. Coming through Birrarung Mar, I was mindful of the fact that the 5.5km course took a different route into the MCG and that the route was probably now opened up to spectators etc. Riding [and radioing] ahead, we soon opened one of the course barriers and moved numerous people out of the way. At this point, I noticed a woman cheering the young guy loudly as he came down the bridge. “Do you know him” I asked. “He’s my son” she replied proudly. “Well, he’s a gutsy young boy” I replied. “I know”, she blurted with tears of pride now running down her face. The entourage grew dramatically as what I assumed to be his entire extended family joined him for the final stages. Onto Brunton Avenue and through Gate C, this young lad got to live his own “Kerryn McCann” moment. I dumped my bike and communication equipment at the gate and charged into the arena. Occasionally we get caught up in the moment of something special and I wanted to be at the finish to cheer him home. The family were furiously clicking cameras as he crossed the line still pushing his walking frame and beaming from ear to ear with his achievement. His race had taken approximately two and a half hours. The marathon clock was showing about 3:30 as he made his way under the finish banner……I hope most of the crowd got to share the moment. Plenty may have run further and faster on the day but none were tougher, more determined or more satisfied with themselves. As a result, I missed most of the marathoners and all of the half and 10km fields but it hardly mattered as I had just witnessed my highlight for the day. 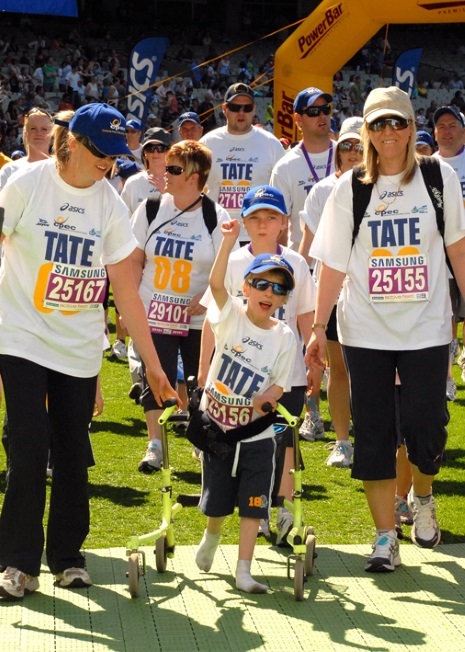 Tate’s mother Sue sent the following details of Tate’s 2017 run. It was another fabulous day, sun shining and many happy people in the crowd, some with PB’s, some grateful just to finish and some with sore body parts. All in all it was another great achievement for many. As usual the 3K walk was such a happy event. Everyone is smiling and chatting away, the atmosphere is so infectious you can’t help but be happy. 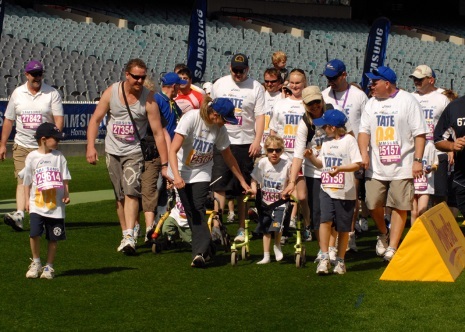 Every year it amazes us how big the event is and to see all the inspiring kids and supporting families and friends makes us extremely proud that over the years we have played a part in its continued success. 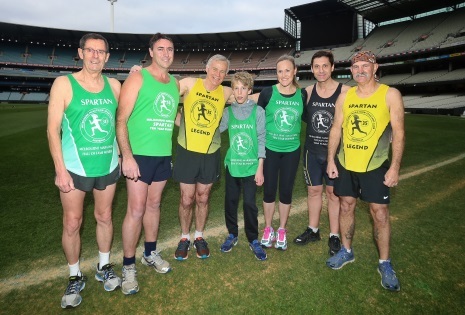 Tate again was in his element, game face on, proudly wearing his green singlet, nothing was stopping him. It was funny to watch Tate and Brenton keeping an eye on each other just to make sure the pace was set. I think they both know the course by now so no navigation needed – they were off. Even though it’s an untimed event, Tate sprouts that he did a PB not sure if that part’s fiction, but he did a great job and kept upright the whole way. I have attached a photo of him nearing the end and you can see the determination in his face to cross the line. He is considering the 5K event next year but it all depends on his training during the year. 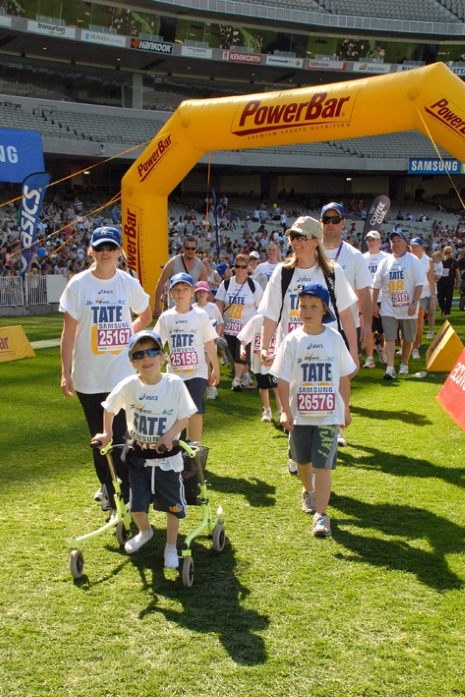 Congratulations to Tate on another successful event.